is a process in which the microneedles are not applied manually to the skin but by motor power that moves a needle module up and down with a high frequency. The needle length is adjusted according to the indication and treatment area. Promote skin repair and reduces the appearance of wrinkles, scars, stretch marks and other signs of aging with the Collagen Induction Therapy. 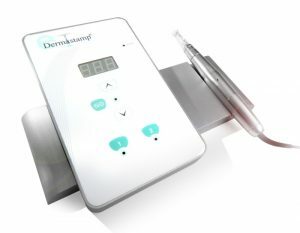 eDermastamp® micro-needling equipment is approved by Health Canada. It is clinically proven, precision-manufactured, medical-grade technology, available to aesthetic professionals throughout Canada.